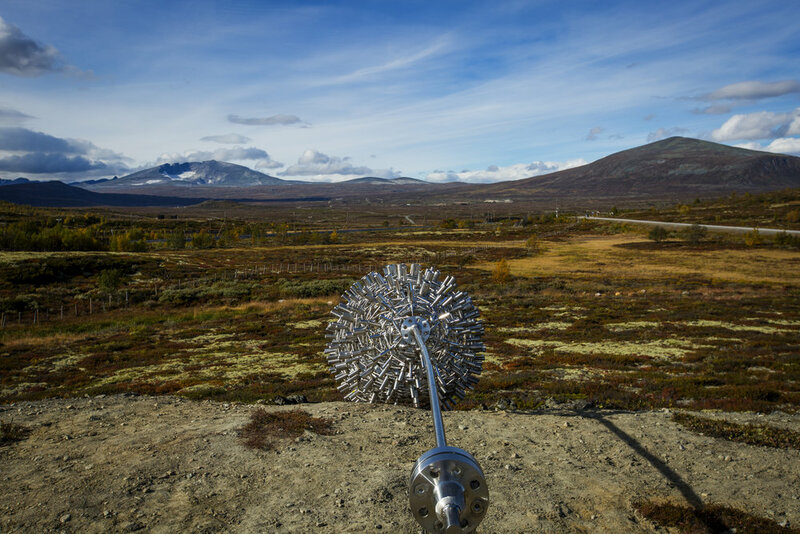 On a slope at Hjerkinn, overlooking the open plateau and the Snøhetta mountain, is Bjørlo’s sculpture Mental Gene Bank. 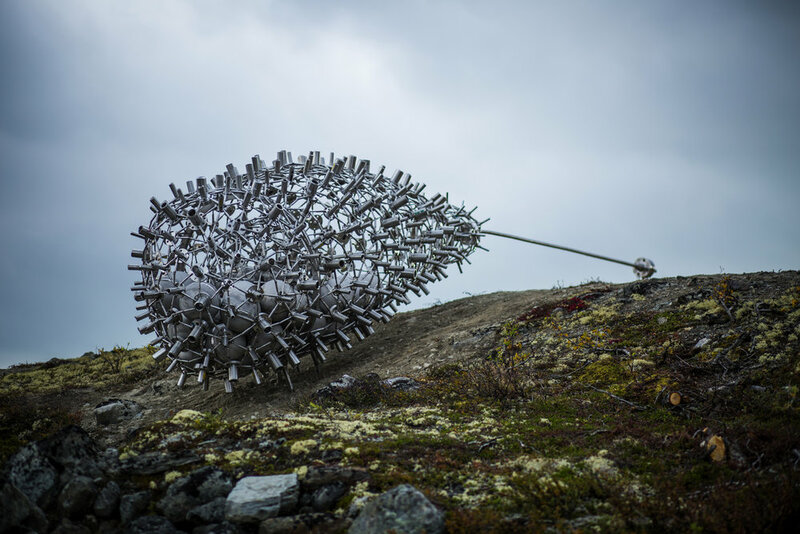 With its rounded shape, tapering towards its attachment point in the ground, the sculpture has a strikingly organic character, despite the fact that it is made of stainless steel, an industrial material often used by Bjørlo. Short, thin tubes form an outer network enclosing the core, which is composed of several spherical elements. 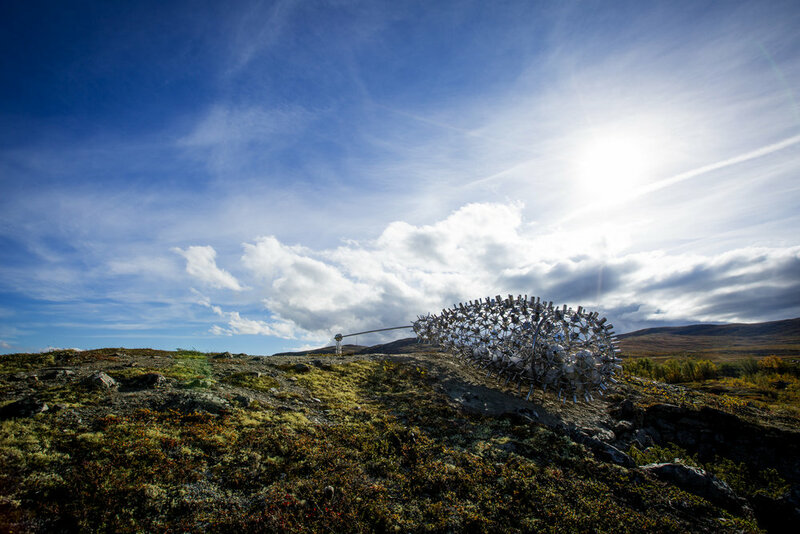 The nature of space plays an essential role in Bjørlo’s work, as can be clearly seen in Mental Gene Bank, where the outer network forms an inner space that finds its counterpoint in the open countryside The sculpture can be viewed as an image of that which is deeply human: private mental space. Bjørlo himself says that the work is about "capturing the way in which we all carry thoughts that we do not share with others”. Per Inge Bjørlo is known for his focused and uncompromising artistic work. In 1984 he created, at Henie Onstad Art Centre, what was probably the first installation piece in Norwegian art history: Inner Room I, consisting of tyres, rubber mats and linoleum prints. Bjørlo works with various different media, but the theme is always the same – the relationship between the personal and the shared. Hjerkinn is a village in the municipality of Dovre, situated in the Gudbrandsdalen valley, in the northern part of the county of Oppland. It is a historic place, where the musk ox graze, and where the mountainous area of Rondane lies, dominated by Snøhetta mountain. The old royal farm Tofte, mentioned in Snorre Sturlasson’s North Kings Sagas, can also be found here, as can the St Olav Ways – the pilgrim paths to Trondheim and the scenic path Vårstigen – which both pass through Dovre. Just as this location has its stories, Mental Gene Bank also carries narratives. And just as the landscape triggers contemplation, Bjørlo’s sculpture gives viewers pause for reflection.